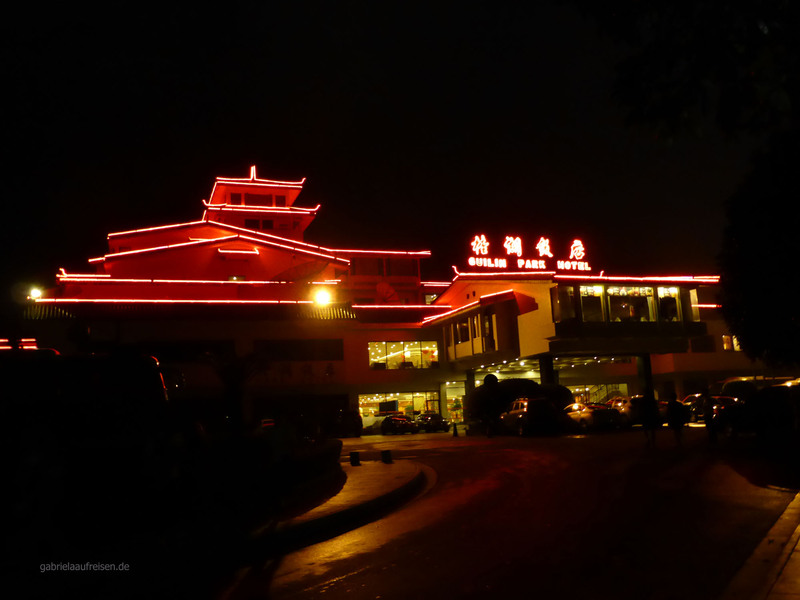 In the late afternoon we arrive by plane from Kunming to Guilin . (Zum deutschen Blog. 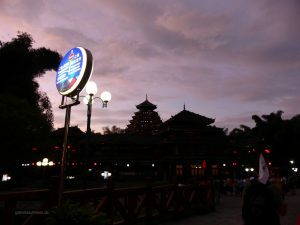 )Here it is very warm, the humidity is very high. It rains frequently in June, but we arrive in the dry. The drive from the airport to downtown does not take long. Even from a plane I can see the incomparable karst landscape. 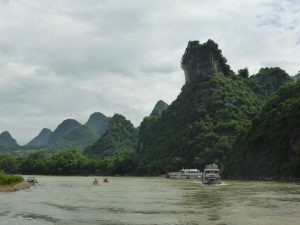 Conical mountains, mostly covered with greenery stuff rise at short intervals from the otherwise rather flat landscape. These hills are also found in the city itself. The city winds round the mountains. It is a curious sight, many of the mountains disappear in the haze of the moist air and the soon setting sun. 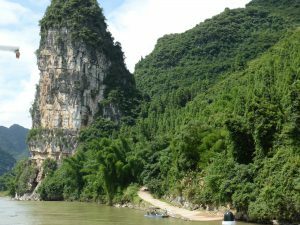 Guilin is known for its rice noodles, which we also have to try. So we head out for a short break and enjoy that local specialty for little money in a food stall. 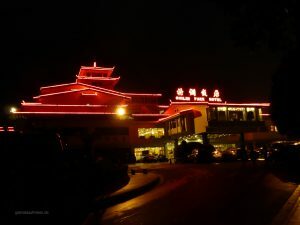 After a quiet night in the Park Hotel, which has got a good Feng Shui, because behind the hotel a mountain provides protection and in front a small river flows, we leave Guilin and drive about 30 minutes to the dock of the tour boat. 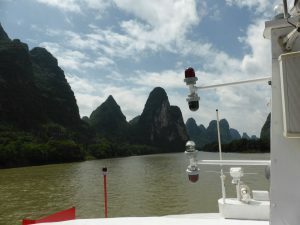 It will bring us in about three and a half hours into the small town of Yangshuo. The travel time depends on the water level of the river. 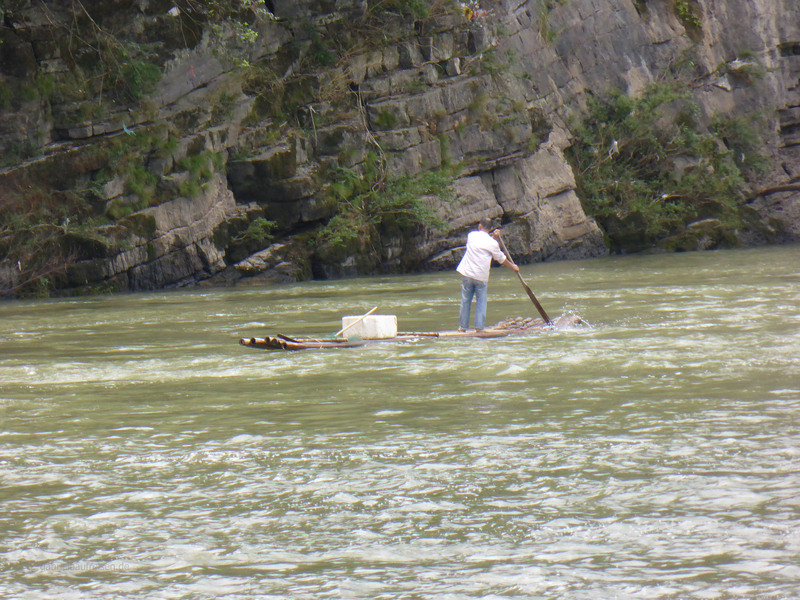 In the past week, a trip was not possible because due to heavy rainfall the river got too much water. Today, it is ok and the journey begins. The boat has got three floors, the top is an observation deck, which is in no time occupied with tourists. 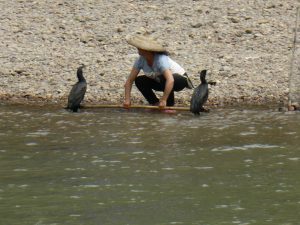 They come from many countries, although not too many foreign tourists are found in this region of China. It quickly becomes warmer, the slight wind can hardly lessen the heat, while it is still quite cloudy. How hot could it be in direct sunlight? Probably most of them stay in the air-conditioned rooms. In any case we enjoy the unique sight of these karst cones, through which we pass now. 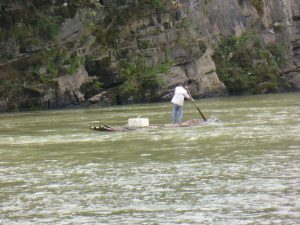 The captain must know the river very well, because there are many shallows and the boat could run on ground very fast, despite the boat´s only 40 cm draught. At this river trip it is definitely worthwhile to look back from time to time, because the conical mountains look quite different from this angle. Again and again rugged mountain peaks alternate with gentle valleys. Everything looks incredibly idyllic and quiet. On the banks and also on the from time to time emerging smaller islands, workers can be seen who collect the washed up trash. The just ended flooding has left a lot of mainly plastic waste in the bushes. At one place we see the now rare Cormoran fishers, who are an interesting sight. Approximately half an hour before we reach the final destination, the landscape changes, the hills are less steep, more round. Here again fruit and vegetables are cultivated on terraces. The sky darkens noticeably. I am glad that I brought my raincoat because suddenly the sky opens its gates and a fierce monsoon begins.We can´t help it, we have to disembark. Within seconds, those are completely soaked, who do not bring any rain gear. Our guide guides us through the “Hello street. Why it is called so, we already know after the first few meters. All shop owners greet us with a more or less loud ” hello hello “.After lunch, I treat myself to a massage before we start to a well known light and folklore show in the evening. In the dark it takes place on an artificial lake in front of the romantic Karst hills. The same artist who designed the opening ceremony of the Olympic Games in China staged this show. A beautiful spectacles I and 2999 other spectators experience. 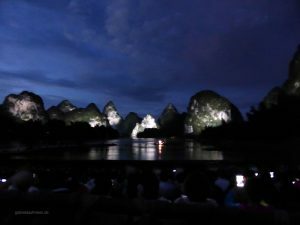 Again and again, not only the mountains are thrown in the light, but also the 600 performers of various ethnic minorities who pursue here a story from their village life. An absolute must for all tourists who find their way to this rather secluded village. 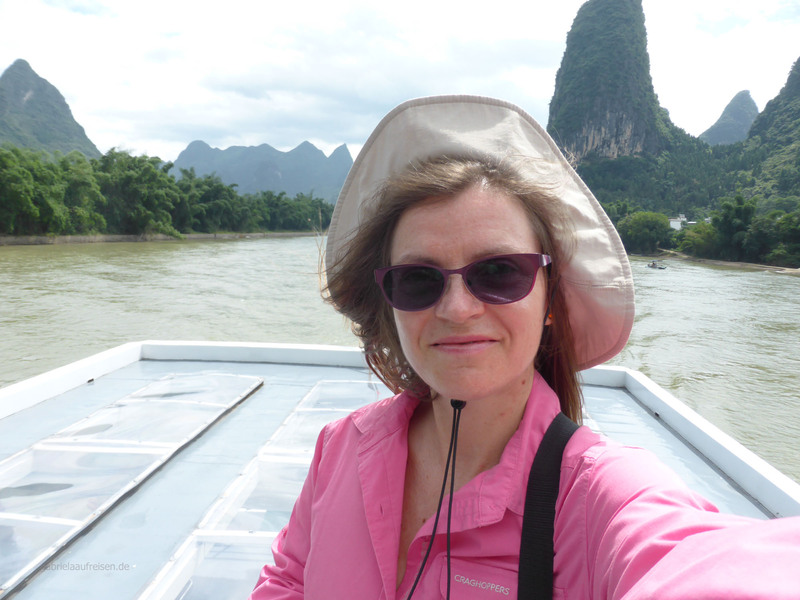 Do you like an update of my various trips? “Like” me on facebook and or on instagram and please leave a comment!